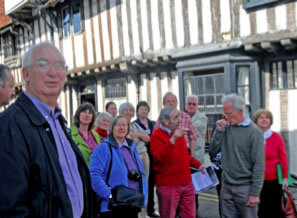 Around 20 members of the Recorders of Uttlesford History visited number 1 Myddylton Place in Saffron Walden, a Grade One Listed medieval timber-framed building, on Sunday 10 April 2011. The building has been home to the Youth Hostel Association for many years until the decision was made in 2010 to sell the property. The Recorders were therefore among the last groups to view the premises while still a hostel. Recorders were joined by guest speakers including architectural historians Bruce Munro, Douglas Kent and Jim Boutwood. The architecture of the building was examined and explained showing how the exterior of timber-framed buildings were at one time plastered, followed by the trend for removing the plasterwork in the 20th century – a controversial practice. Details of the preserved early 16th century shop front showed how wares were displayed for sale on ledges which attracted customers on the roadside. Zofia Everett described her long association and affection for the building and her campaign to preserve the important and rare woollen and silk tapestry which lined the central stairwell. Thankfully the tapestry has been recovered, cleaned and restored and has a new home with Saffron Walden Museum, while research continues here and in the archives of Lille Museum to help establish manufacture of the tapestry to the 17th century Lille workshop of Guillaume Wernier. Recorders were most interested to learn the contextual setting for the construction of important buildings in Saffron Walden circa 1520–1550 when wealthy patrons founded religious and secular organisations aimed at protecting the town from crippling Crown taxes. The links between these buildings and the Master carpenters working on the construction of Kings College Chapel, Cambridge were evidenced in the timber frame of 1, Myddylton Place – a sure indication of the Kings College carpenters working in the town.